Then I Got To Thinking...: 6 Days! hope you have a stress free week! can't wait to see some wedding pics! So excited for you! That Villa is gorgeous! You have an amazing week planned! Yay!!! So exciting, 6 days!! I can't believe it's almost here! Enjoy! I am very happy for YOU!!!! That is SO exciting!! A week from today you'll officially be a mrs! Enjoy every moment! Aww!! congrats and best wishes!!! Can't wait to see pictures! This week is going to be so exciting for you! Enjoy every minute of because that's what memories are made of. Thanks for the restaurant recommendations - I have added them to my list. You must be so excited!! Can't wait to hear all about it! So soon!! I'm excited for you. This is it girl! we are doing a spa for the girls/golf for the boys day the day before our wedding! Oh my gosh... your chain is getting so small!! And I am squealing with excitement over here on my end just thinking about all of the fun things in store for you over the next week!! Do you realize this is the LAST Sunday you will ever spend unmarried??? 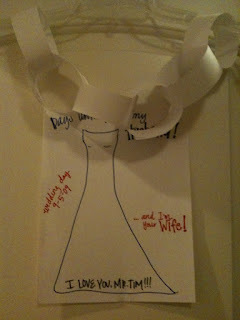 next Sunday you'll be TL's wife... how cool is that?!?! Yaaaay everything is coming up so quickly, glad you are soaking in the moments and that you have had some time with your mom this weekend! That villa looks so enchanting, I hope you have a lovely time there! Also, have a blast on your girl spa day - sounds so relaxing! I better get working on my guest blog post, hope you have a lovely evening lady! 6 days!! ohhh myyy gosh!!! sooo close!! Ohmygosh!! I am so excited just reading this!!! Have you decided to let anyone guest blog?! B/c I am SOOO going to be pumped to read a little about your wedding and see a few teaser photos til you get back from the honeymoon and can post more!!! You're going to look so gorgeous and have such a great day!! And the week's festivities sound awesome too!! I'm off to go check out that villa you linked now! :) XOXO! Agh-you are too sweet!!!! (1) I am so pumped that you're going to hopefully find a little time to update all of us!!! and (2) I would LOVE to guest blog a post for you while you're gone!! I'm so flattered! :) *really smiling over here* lol! And uh.. that villa=a.maz.ing. WOW! YAY!! I hope everything goes amazing!! So so exciting! I know it's going to be just incredible. Remember what I said...savor this time! Can't wait to read all the recaps of your big week! That is so exciting, Tracy! And oh my gosh, that villa looks absolutely gorgeous! What a lovely place to spend time with the gals most important to you! Enjoy these special days leading up to your wedding! I'm so excited for you! And the location is positively breath-taking. Also - I love that you said the boys would be watching the USC game...that would totally happen if it was my wedding as well! Have a WONDERFUL week! So many exciting things and I just love that villa! I am so happy for you!!! p.s. email coming from me this evening! Everything will be perfect... I know it! HOW EXCITING!!! Have fun and enjoy EVERYTHING! Can't wait to see pictures when you get back. Yes, I'm new to your blog but still just as giddy for you! Congratulations!!!!! Soooo exciting! I wish you all the very best!! Oh my gosh, so exciting! I hope everything goes smoothly for you this week! Oh my gosh, I got yer butterflies right here..in my stomach! EEEKKK!!! Enjoy this time! I'm so glad to hear how excited and happy you are. Everything is going to be wonderful and it sounds like you have lots of fun things planned leading up to the wedding. Good luck with everything, that is so exciting! The Villa looks amazing, too. Twitter and I had a fight yesterday and it won...til today when I told it who's boss. ;) Hope you got my email addy I sent! I just didn't want it out in a "googleable" forum since it's my full name and all. (googleable should be a word). XOXO! You are going to have a GORGEOUS wedding!!! I cannot wait for pics! I emailed my guest post! I hope you like it! ENJOY!!! you will undoubtedly be a beautiful bride -- and a gorgeous, happy couple! Congrats! !